About the author: This guest post is by Ryan Woroniecki, the Vice President of Strategic Partnerships at DonorSearch, a prospect research, screening, and analytics company that focuses on proven philanthropy. He has worked with hundreds of nonprofits and is a member of APRA-MD. When he isn’t working, he is an avid kickball player. All nonprofits need to raise money in some form or fashion. While some organizations throw fundraising events like galas or auctions, others rely on mailed-in or online donations. Whatever method your nonprofit employs, it can probably use a little boost. There are tons of tricks, ideas, and resources out there; just Google “fundraising tips” and you’ll see what I mean. But, if you want to get to know your donors a little better and raise more money for your organization, you’ll keep reading. Prospect research is a tool that nonprofit organizations can use to find out more about their donors. Information gained from a prospect research screening can range from basic data like donors’ ages and addresses to more complex information like business affiliations and past giving patterns. While there are many benefits to using prospect research in general, it can be a great resource for nonprofits who want to make the most of their fundraising efforts. Here are the top three ways you can use prospect research to help you fundraise more effectively. Conducting a prospect research screening reveals donors’ past contributions to your organization, other nonprofits, and political campaigns. While it is good to have this data simply for your records, it can also be helpful when you are trying to identify major gift prospects within your current donor database. If an individual has been contributing to your organization for a sustained period of time and the donations have been increasing over the months or years, the donor may have the potential to be a major gift contributor in the future. While past giving is not the only indicator of a potential major giving prospect, previous donations do indicate a commitment and dedication to your nonprofit. A strong belief in your organization’s cause can be a driving factor for an annual donor to become a major gift donor. In addition to determining which donors might be willing to contribute a major gift, prospect research can help your organization point out donors that have the capacity to give larger donations. Healthcare organizations, for example, use prospect research to help determine what patients, employees, and physicians have the potential to give major gifts. Plus, they use prospect research to pinpoint the amount they should ask each major donor to contribute. With this type of information, your organization can accurately ask donors for major gifts. When you have a specific amount you're asking for, donors are more likely to give (even if it is lower than what you asked for). There is no shortage of fundraising event ideas, tips, and tricks that can help your nonprofit’s next event stand out from all the rest. But whether you’re hosting a gala, walk-a-thon, auction, or dance-off, your fundraising event can benefit from a healthy dose of prospect research. It would be nice to invite all of your donors to your next event, but unless you plan on renting out a Super-Bowl-sized stadium, you’ll have to narrow down your guest list considerably. Luckily, prospect research can help you identify the donors that will help your fundraising event generate the most revenue. Additionally, prospect research may help you identify which donors have relationships with local businesses who can serve as sponsors for your next event. By identifying major gift donors and regular contributors and putting them on your guest list, your nonprofit can benefit from the generosity of individuals who deeply care about your organization and the projects that you are attempting to accomplish. When you reach out to donors and volunteers asking them for their money and time, you want to make sure that the information you have on file is correct. If you send out direct mail correspondence, you don’t want the majority of the material going to addresses that no longer house your donors. Prospect research can help your nonprofit fill in the blanks about existing and potential donor data. Not only can you learn about donors’ past giving histories, but you can learn basic information like first and last names, addresses, and marital statuses. Having this key data at your fingertips can help you get to know your donors a little bit better and establish stronger connections with them. Stronger connections lead to donors being more enthusiastic about your nonprofit and what you are trying to accomplish, which can ultimately result in larger donations at your next fundraiser. Additionally, donor engagement is a key indicator of whether a donor might be a good planned giving prospect so it's important to document a donor's relationship with your organization. Prospect research is an invaluable tool that your nonprofit can and should be taking advantage of. While there are numerous benefits to conducting a prospect research screening, you can use this resource to help your nonprofit’s fundraising efforts and raise more money for your organization’s cause. DonorSearch is a leading provider of prospect research to nonprofits of all types, including charities, healthcare organizations, fraternities/sororities, religious organizations and educators. 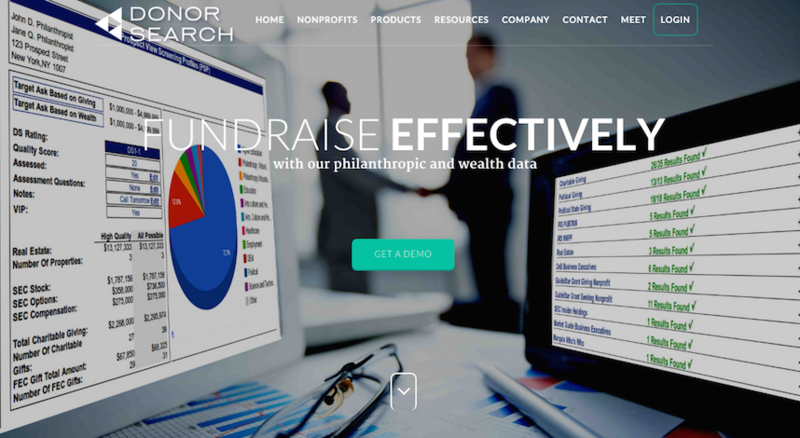 Using information from 25 databases, DonorSearch uses proprietary algorithms to help clients find the best philanthropic prospects. DonorSearch’s data can be easily integrated with most common donor management and general sales software, putting critical donor information at a client’s fingertips. With this integration, Salsa CRM clients can access DonorSearch prospect research data without leaving their portal. Many Salsa CRM clients currently use this integration including: AAMDS, Fannie and John Hertz Foundation, Camp Fire Columbia. To contact a DonorSearch expert about your prospect research needs, please email info@donorsearch.net or call 410-670-7880. You can also request a demonstration here to get an inside look at DonorSearch. The integration itself is FREE. There is additional cost from Salsa to set it up. The only thing you would have to purchase is a subscription to DonorSearch. Upon setting up your DonorSearch account, you can sync it with Salsa CRM.